Strain relief heated bed-cable AnyCubic 4MAX by Coat is licensed under the Creative Commons - Attribution license. A strain relief for the Heated bed-cable of the 4MAX. 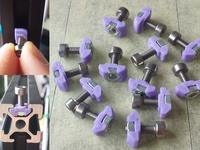 This part can be mounted without screws, bolts or nuts. 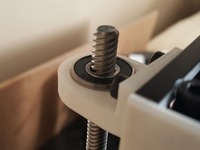 It is designed using the shapes of the printer and, once placed, stays fixed and sturdy. Placing needs a little force. Secure the cable with two pre-fitted tie raps. See pictures. There are two versions, one leads the cable straight to the back, and one in a 45 degree angle. The first one gives more room between the base-plate and the cable, but the cable rubs probably against the back-plate of the chamber. 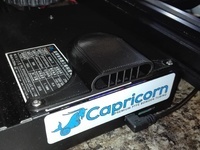 The 45-degrees version leads the cable closer to the base-plate but free from the housing of the printer. The second one is my personal favorite, but there is a choice. The best way of slicing is top-down (as in the STL's) . You need support in that way. Another way is to slice it laying on the backside of the part. You don't need support that way, but your part becomes weaker and will probably snap during install. PS. 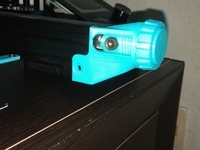 With slight adjustments you can use the base of this part for other purposes, mounting LED-lights, camera (not very useful for this type of printer), nozzle wiper or.... Feel free to remix it.